So today we had the latest in our series of occasional house gaming afternoons, inviting friends around with the intention of getting through a good selection of board games and making it much more of a social experience than we usually manage. This time we got up to eight of us: five adults and three children, which made things rather different to previous times when Miss B had been the only junior gamer there. Miss T’s chariot maintains its commanding lead… for now! On the arrival of our first group of guests, the two visiting children, T and R spotted Castle Panic in the games stack and wanted to play it as they had played it with someone else they know. Excellent choice. So we got through a five player game which started rather gently but then got into full panic mode once the youngest player managed to pull a chain of monster chits that provided about six or seven new foes for us to battle. We finally managed to survive with only one of our towers left standing. Now that is a great result for a cooperative game: a victory for the team, but only by the skin of the teeth. Lots of fun. By this time we had a couple more arrivals, so we had a slight change of personnel at the table for a game of Giro Galoppo, which is one of the most chaotically pleasing race games I’ve come across. This was followed (with our final arrival) by one of my all-time personal favourites, Ave Caesar, just for a single race as to do the full four race series that the game suggests would be just too much for the kids. Both of the race games went down well and everyone seemed to enjoy themselves. Most people can get behind a race game as a concept, and both of these are beautifully executed examples and really show how much things have developed from the old “roll a die, move a dobber” mechanism. One of the guests, who hasn’t played these sort of games much, was somewhat surprised at the lack of randomness in Giro Galoppo (there isn’t actually any at all) but was very taken by the game once it had got going. After losing the other family, we got out Forbidden Island, although once we had set up Miss B said that she wasn’t interested in it. The day was getting on a lot and she was getting tired, so she decided to sit on my lap while the rest of us played. Despite that, towards the end once it started seeming like we may possibly win (after it looking quite ropey for a while), Miss B started engaging with the game and helping out. Again a narrow victory for the team. Finally Miss B got out Vanished!, which she was keen to show off to our guests. We set the game up with a couple of the cards removed in order to make things a little easier and quicker. Everyone started off at different rates but then got uniformly confused until somehow we managed to end up with a five-way draw, which seemed to me to be an excellent and appropriate way to finish off the afternoon. So, thanks to all our lovely friends for taking the time to come and play with us. We had a lot of fun and hopefully will do this again some time down the line. We had a few friends (and a couple of friends-of-friends) come to visit for an afternoon over the weekend with the intention of playing either some games or some folk tunes as the mood took us, and in the event this turned into quite a serious games day, with tables on the go in two rooms. This was Miss B’s first experience of “grown-up” social gaming and I’m very pleased with how it all went. I completely neglected to take any photos, so this post will go unadorned. It must be said, though, that my photographic skills fall somewhat short of professional standard to say the least (as you’ll know from previous posts), so you’re not missing out much. Miss B kicked off with a couple of rounds of Ghost Party without the messing about with scoring, then on to a mildly simplified Enchanted forest. Next up was Giro Galoppo, which was a hoot for the rest of us, but a few turns in Miss B heard a game of Uno starting up in the other room and decided to switch her loyalties. Then she rejoined the crowd in the dining room for a round of Ave Caesar. All in all this seemed to go really well. Aside from the switch from Giro Galoppo to Uno, Miss B maintained an admirable focus most of the time. Yeah, she slowed play down quite a lot at times, but everyone was very helpful and accommodating (so huge thanks to everyone for that) so she ended up telling me how much fun she had had. And, of course, one of the key success metrics related to young children is whether or not things end in tears at any point. Well, I don’t think B won any games, but I don’t remember any tears at all until we reached bedtime. I hope we can do something like this again soon. Giro Galoppo has been around a few years, but I had only heard of it fairly recently as a game similar in mechanic to Ave Caesar. Anyway, it sounded like the sort of thing we’d all like around here, so what the heck, let’s order a copy. Opening the box took me back to my time in the early 90’s when I was first introduced to German boardgames with their lovely wooden pieces and well illustrated and produced cards and boards. I mean, who wouldn’t love little wooden horses, all in different colours, with coloured jockeys to go with them. You can mix and match and then name your horses. All win so far. Plus the set up involves placing fences and hedges around the course to add some variety. Times have changed though, as you no longer have to go through the hunt for a rules translation like we used to: the box contains a shiny colour rulebook in German, plus a black and white booklet containing translations into several other languages. The mechanism is fairly straightforward, everyone selects a number card from their hand; lowest numbers move first, if you land on someone else you bump them back, and you can’t move onto a fence or other obstacle. Actually, although this game is aimed at children, this is one of the harder ones for Miss B to play right now as it involves a fair degree of thinking and planning ahead. B is getting pretty good at making instant decisions, but trying to guess what other players are going to do is an important part of this game. She loves the horses and riders though, and the deeper understanding will come with time. Again, this was fun as is, but would be a lot more fun with more players. 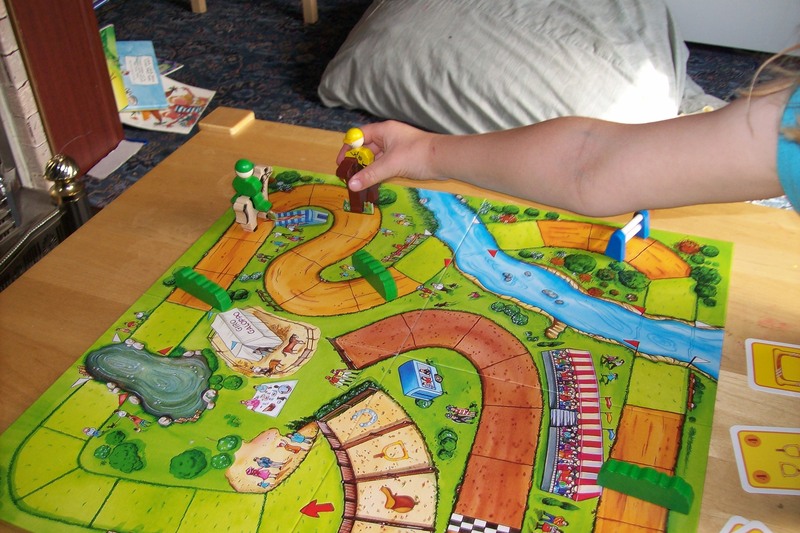 The game: Giro Galoppo (Selecta Spiel), 2 to 5 players, aged 6+.